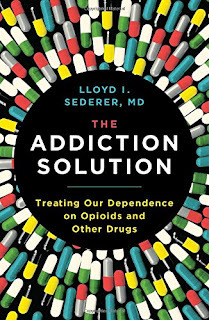 THE ADDICTION SOLUTION :: LLOYD I. SEDERER, M.D. A version of this review was previously published in Shelf Awareness and appears here with permission. "Drug taking is a highly complex and variable human and social phenomenon...[that] is not going away." Material on addiction is seemingly limitless, and choosing who and what to believe can be treacherous territory when lives are at risk. Lloyd Sederer, M.D., chief mental health officer of the New York State Office of Mental Health, brings a prestigious pedigree to his perspective, The Addiction Solution. 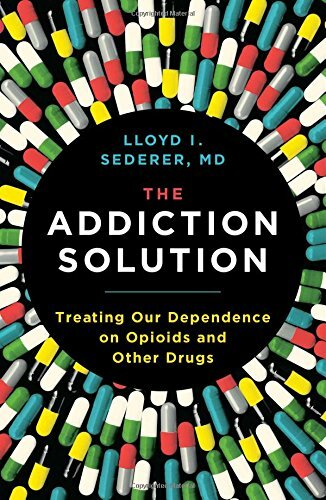 Sederer engenders confidence on numerous fronts, particularly in acknowledging that drugs are winning the "War on Drugs" by a landslide; that current drug policies are actually institutionalized racism; and that there is no "one-size-fits-all" answer to a very individualized epidemic. Confining his discussion to illegal drugs and the abuse of legal drugs, Sederer presents a straightforward, plain-language overview of available options and best-care treatment scenarios. He advocates the use of social values and family influence over "control and consequences," which he considers a "puritan approach" akin to tilting at windmills. Moreover, a community methodology emphasizes identification of risk and the importance of eliminating adverse childhood experiences. As Frederick Douglass said, "It is easier to build strong children than repair broken men." Summarizing available methods and treatments, Sederer believes single-method recovery (i.e., 12-step) is not the road to maximum success. He recommends a multifaceted plan attacking addiction on multiple fronts that enhance one another. The Addiction Solution offers guidance; it is not a textbook or exhaustive treatise. It proposes tools to fight the disease and plainly, though not overly simplistically, suggests the best means to implement them. STREET SENSE: A common sense overview of the various means and methods to fight addiction based on a community and multi-treatment methodology. COVER NERD SAYS: This cover didn't really float my boat and, frankly, didn't fill me with confidence. When I read the author's credentials I felt much better and the theories presented were actually quite valuable and well-presented. I wish the cover weren't so elementary, although I can see how a more "intense" or "serious" cover could lead one to think this was a treatise-type work and fail to attract the target audience. Tough call, but I would have liked to see something a bit more formal.